Andy Kelp darkens Dortmunder's doorstep with a proposition: rob the Capitalists' and Immigrants' Trust bank. The bank is under renovation and business is currently being done out of a mobile home. Together with his usual crew of Murch, Murch's Mom, Kelp, and some newcomers, Dortmunder plans to make off with the entire bank, trailer and all. How hard could it be? I should create a shelf called Why The Hell Isn't This Still in Print? Westlake's early Dortmunder books would be all over it. 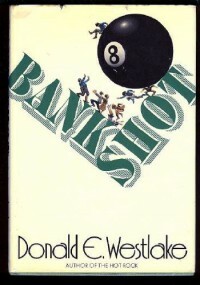 Bank Shot is a comedic caper, as Dortmunder's usually are. Victor and Herman X, the newcomers, fit in pretty well with Dortmunder's quirky crew. The plot had a lot of twists and complications. While I knew things wouldn't go Dortmunder's way, I had no idea to what extent. Westlake's writing in this one is pretty damn good. It continues to amaze me how he can write Dortmunder's comic capers and the Parker books under his Richard Stark pseudonym with such different styles. His comedic timing is great. Also, I caught references to the Continental Op, Elmore Leonard, and Parker in the text. I highly recommend not only Bank Shot but the Dortmunder series as a whole.